A few months back, Bob Moore—the real Bob of Bob's Red Mill—came to town, along with some of the country's best bakers, to showcase his new line of baking flours. A few months back, Bob Moore—the real Bob of Bob's Red Mill—came to town, along with some of the country's best bakers, to showcase his new line of baking flours. It was a dazzling event at the Astor Center, with magnificent flowers and spectacular pastries and confections. Among all the beautiful sweets, I fell hard for these simple white cupcakes from the Sugar Bakeshop in Charleston. The crumb is supertender, since they're made with pastry flour, with a lovely light orange flavor, and the grapefruit zest in the frosting gives it just the right hint of bitterness. These are a bit larger than the bakeshop's demure cupcakes in the photo, but they can be made in any size, mini or maxi, as long as you adjust the baking time accordingly. 1. Make the cupcakes: Preheat the oven to 350° and line a 12-cup muffin pan with paper liners. In a small bowl, sift the pastry flour with the baking powder and salt. In another small bowl, whisk the eggs until frothy and lemon-colored, about 3 minutes. In a large bowl, using an electric mixer, beat the butter with the sugar, vanilla and orange zest at medium speed until fluffy, 2 minutes. Beat in the eggs. In 2 batches, alternately mix in the dry ingredients and the orange juice and milk, beginning and ending with the dry ingredients. 2. Scoop the batter into the lined muffin cups. Bake the cupcakes in the center of the oven for about 20 minutes, until springy and a toothpick inserted in the centers comes out clean. Let cool slightly in the pan, then transfer the cupcakes to a rack to cool completely. 3. Meanwhile, make the frosting: In a small saucepan, simmer the grapefruit juice until reduced by half, about 4 minutes. Let cool. 4. In a large bowl, using an electric mixer, beat the butter with the grapefruit zest at medium speed until smooth and light, 2 minutes. Add half of the confectioners’ sugar and the reduced grapefruit juice and beat at low speed just until incorporated. Using a spatula, scrape down the sides of the bowl. Add the remaining confectioners’ sugar with the heavy cream and beat at low speed until incorporated, then beat at medium speed until smooth. 5. 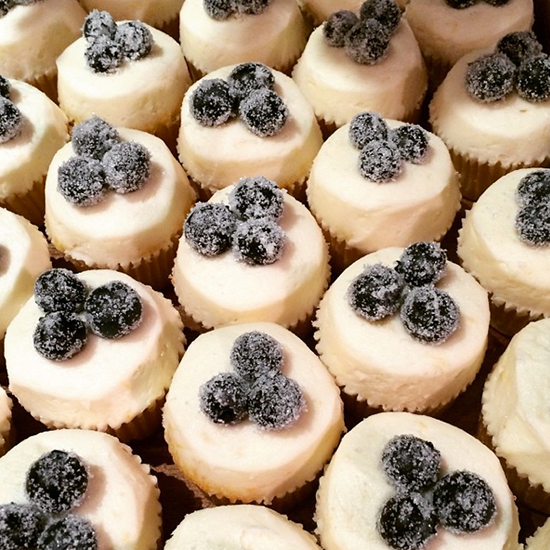 Frost the cupcakes generously and garnish with sugared blueberries if desired.